We’re wanting to expand the Frags and Beer team so we’re looking for more content creators in the following areas. More may be added later. I also have to be up front, we are a non-profit community site with no ad revenue or subscription. This is not a paid gig, we do this for the love of all things Geek. Frags and Beer Radio: With the addition of a Sound Cloud channel we could use other voices to do reviews, interviews, or discussions to share. Regular content is most welcome, decent recording equipment (I did mine on a CM Storm gaming headset could you tell), and ability to edit your own audio a bonus. Requires no money to start as I found, recorded with free software and edited with free software. Game Reviews: Any and all games, new, old, any platform. This position would be an independent game reviews writer who would be responsible for acquiring the game they want to review, play through, and review on their own. We will assist, when we can, in acquiring review copies, but as we are a small site they can’t be expected. Reviewer would be required to disclose any review copies received, and also disclose any and all connections to developers or publishers involved in the game. Tech Reviews: Geek interests go hand in hand with technology and gadgets and we’d love to cover more. As above the reviewer would be expected to acquire the tech, or access to test samples and review on their own. We will assist, when we can, in acquiring any tech for review, but as we are a small site, again, it can’t be expected. Full disclosure will be mandatory. (Currently filled) Movie and TV Reviews: Like the others, this is an independent review position for old and new movies and TV. There is little chance of seeing ‘review copies’ but disclosure of connections and comped tickets to shows would be mandatory. Staff Writer: This is a general catch-all position for writing about the other geek interests and features at Frags and Beer. We don’t want to see much overlap into the major categories above, but covering anime, cons, cosplay, models, gunpla and the like would fit well into this position. 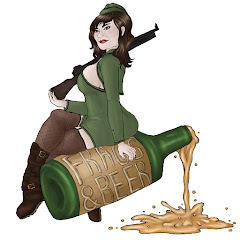 You Tube: If there is interest from someone or more than one person wanting to do reviews, streams, interviews or basically cover geek interests on YouTube we would love to start a Frags and Beer You Tube channel in connection with the webzine. If any of these positions interest you drop us a line at xamot@fragsandbeer.com for more details.